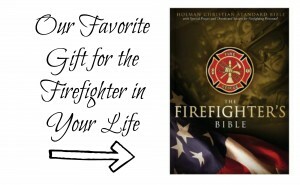 Why does this harmless pole freak out this sane and rational fire wife? At my husband’s station, the kitchen and sleeping areas are upstairs. So of course the fastest route to the trucks is down the pole. This is in an approximately 10×10 room with heavy duty commercial doors on opposite sides of the room entering from either the kitchen or the bunk room. And its only feature is a GIGANTIC HOLE IN THE FLOOR DROPPING AT LEAST 100 FEET TO THE CONCRETE BAY FLOOR. So let me set the stage. I’m not a wussy girl. I’ve done some pretty spectacular mountain biking in my day (no, I am not talking about in Ohio but on real mountains. Yes North Carolina but more impressively, in the Swiss Alps.) I’ve jumped off of rock cliffs into deep lakes in Alabama. And I’ve been a roller coaster thrill seeker. But when I go to the firehouse and go anywhere near the pole hole, my heart races like an agoraphobe who needs to take a trip to the doctor. What is the blame for this irrational fear? Motherhood. 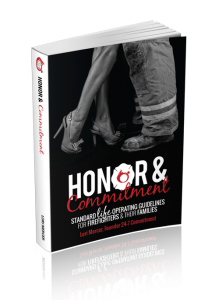 I met my firefighter when I was a divorced single mama with a just turned 2 year old boy. We loved visiting the station with the big slide down to the trucks. Take us there everyday! But the pole hole Freaked. Me. Out. My fear has always been stairs (and escalators but I’ll leave that for another post). Carrying my new born babies down stairs was so anxiety inducing for me I would frequently sit down and scoot on my bottom. No matter how hard I tried, I kept visualizing myself slipping and falling and dropping the baby down the stairs. This has sense improved and I only feel a moment of panic if I have some loose footing on a step here or there. Still makes my heart skip a beat! But back to the pole hole….. I must have suffered 100 mini-heart attacks every time one of my tipsy toddlers have dashed towards the pole hole door over the past decade. There is no way in the world I’m leaving my unattended children leaning precariously over that ginormous hole watching me slide all the way down. 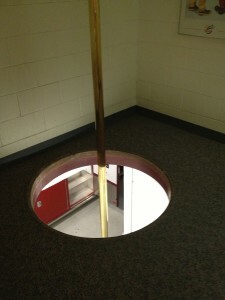 And I leave you with this view of the aforementioned ominous pole hole. Now do you see what I mean? It’s practically read to leap out of the picture and swallow a small child. This post made my day! Glad to know Im not the only nervous nelly and I have TEENAGERS!! Our stations that actually have poles have these covers under them that take 100 lbs to open and gates. You can open them by pushing down on the pole, but it takes a lot to do it that way. I love it because even if my daughter wanted to go down the pole, she couldn’t. So a crawling baby would be “caught” by the little cover. It’s nice. Or else, I’m not gonna lie. My mommy heart might freak out a little!